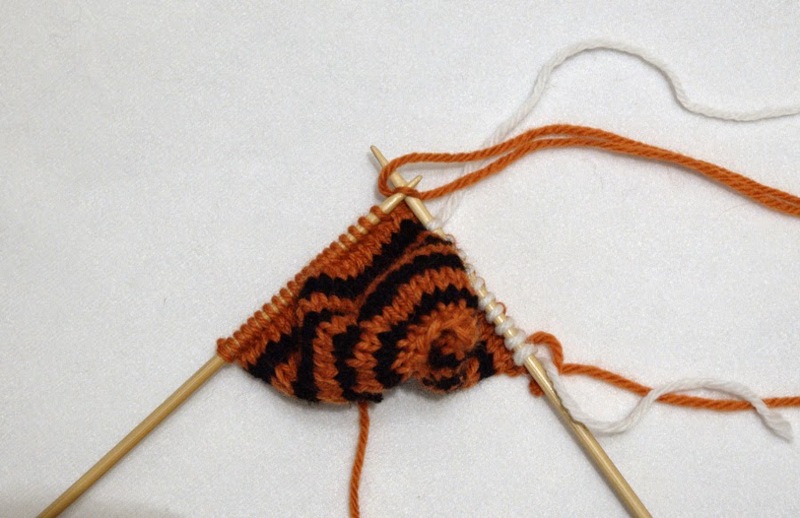 My Tiger pattern uses some more advanced techniques, one of which is intarsia. I like this technique for creating face markings on my toys, so I thought I would share how I work intarsia colour changes in knitting. 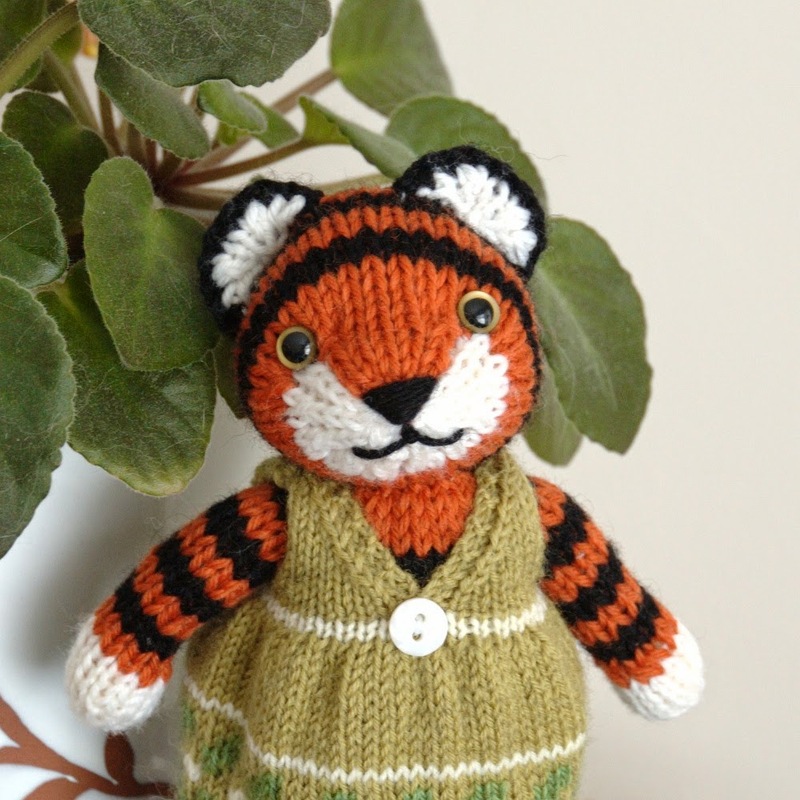 The piece of knitting shown in the tutorial is the head from my Tiger pattern (available on Ravelry or Etsy). Before beginning Step 1, work Rows 1-19 of the piece. Note that you can click on any of the photos to view them in full size for more detail. Step 2: Here I've worked the first section in white, and now I want to change to orange. I add the new colour yarn in the same way as described in Step 1. 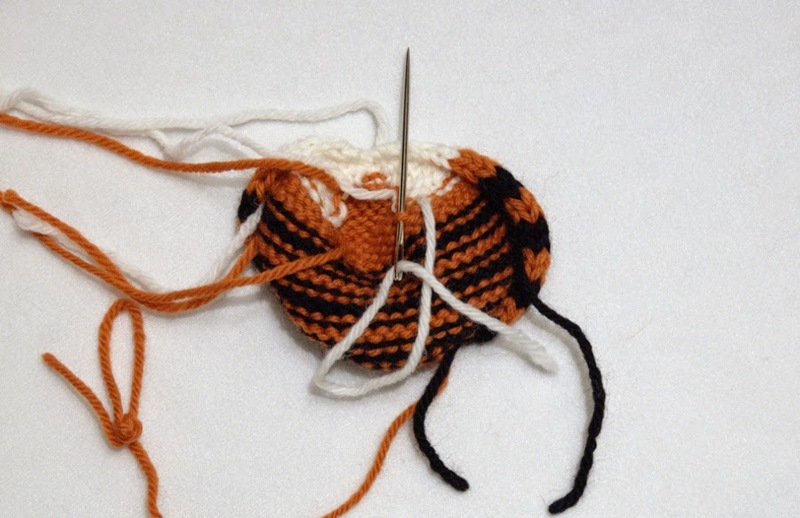 You want to make sure you leave a long enough end on the wrong-side that it will not come loose as you knit, and so you have to enough to weave in when you're done. 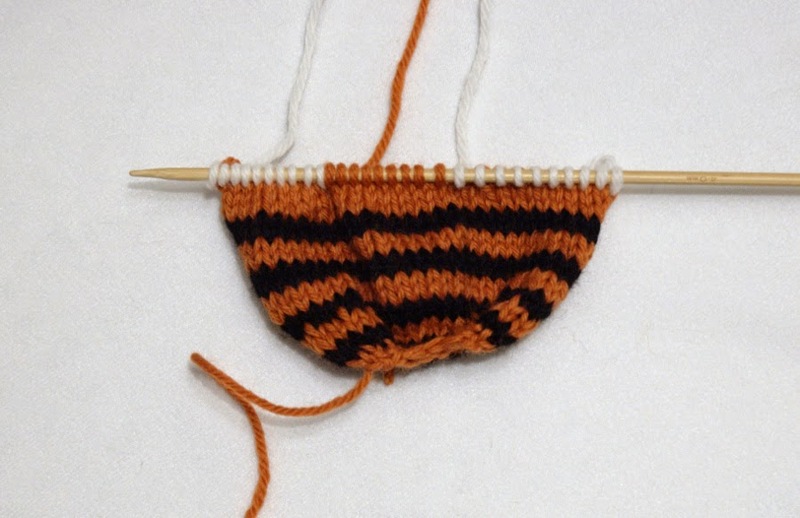 Step 3: I've now worked the middle section in orange, and I want to begin another section of white. 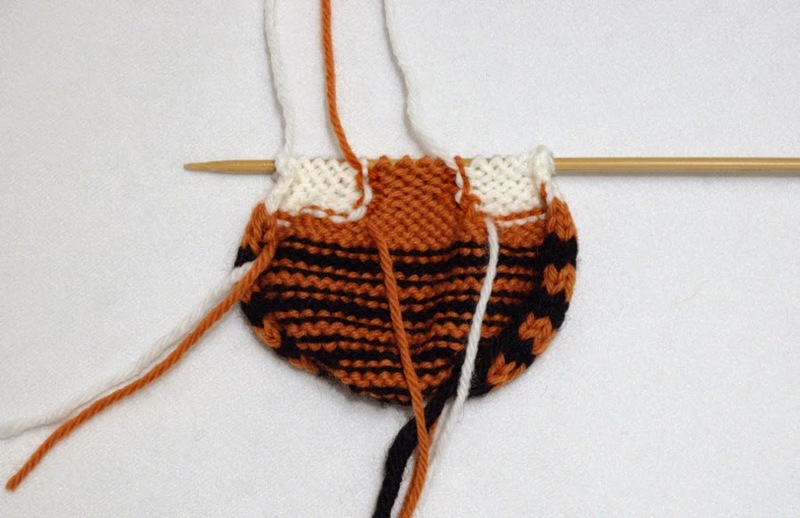 You need to use a separate piece of yarn, because you are not carrying the white along behind the orange section. Here I've finished Row 20, and you can see the three sections of colour. (The loose yarn ends are hidden behind, and you see the three I am working with). Step 4: I've begun Row 21, working the first white section. When I come to the place where I need to change yarn colours, I lay the first yarn (marked with blue dots) over top of the yarn I need next (marked with green dots). 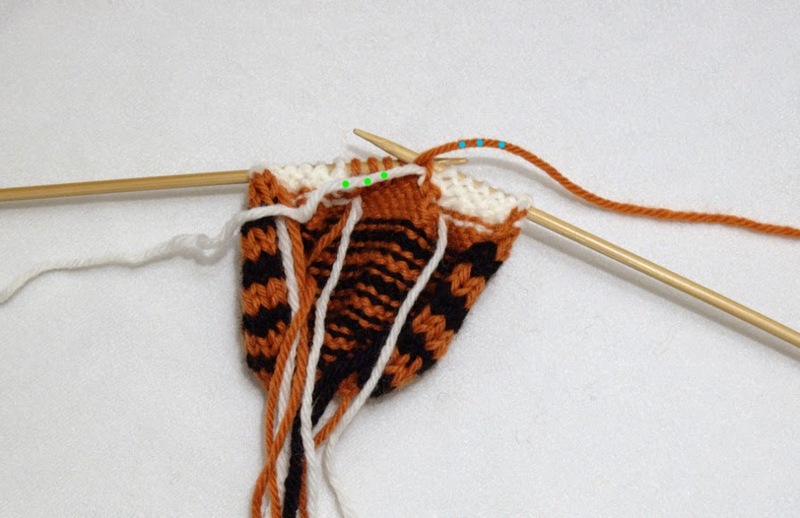 This way, when I pick up the orange yarn to purl the next stitch, the two yarns are twisted together. This prevents holes in the piece as you change colours. 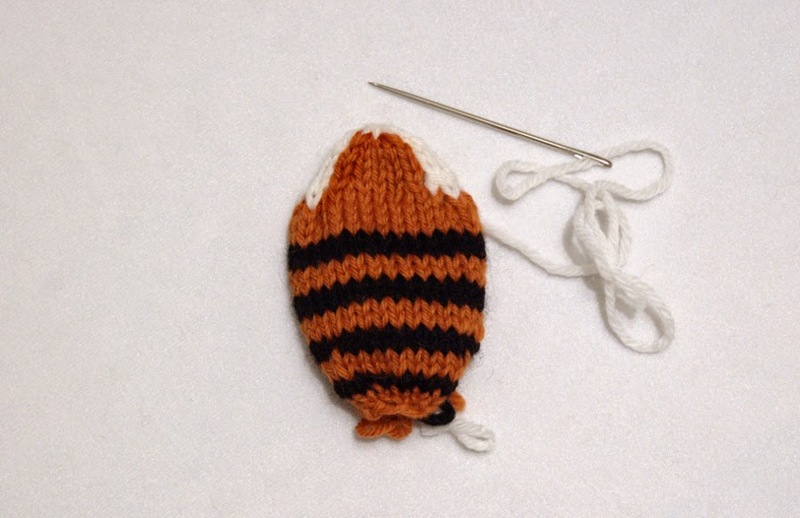 Step 5: I've worked the orange section of Row 21, and now I'm changing to white again. 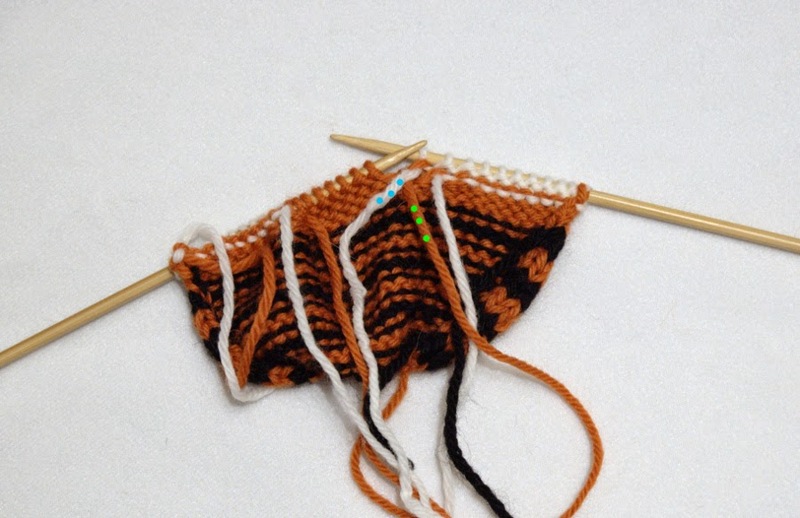 You can see where the orange yarn I just used (marked with green dots) is twisted with the yarn I'm using to make the next stitch (marked with blue dots). Step 6: I've finished Row 21, and worked Row 22. This photo shows Row 23, where I am changing from white to orange. 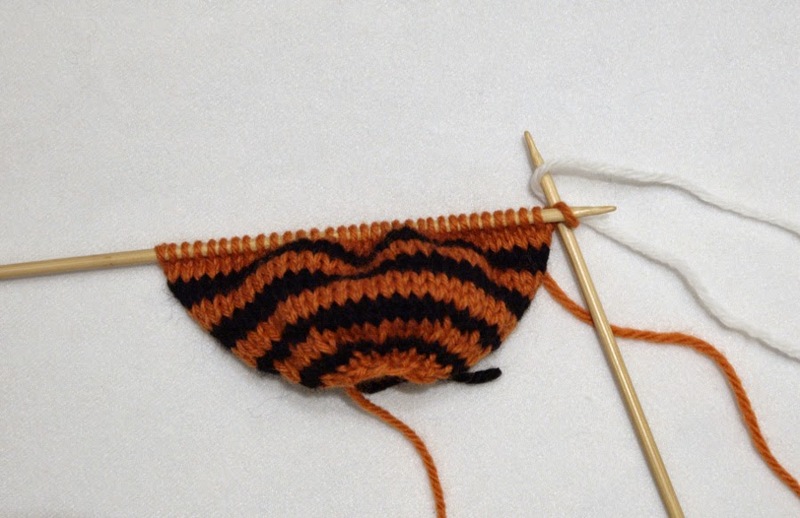 You can see how the two colours were twisted together in previous rows. This makes a sort of seam between the two sections of colour. Practice will help you maintain an even tension as you change colours. Here is the piece from the wrong side. You can see more clearly now where the two yarn colours are twisted together. This simple technique is how I work intarsia. In this photo, I've worked the last row of the head, cut the yarn, and threaded the end through the stitches to gather them together. 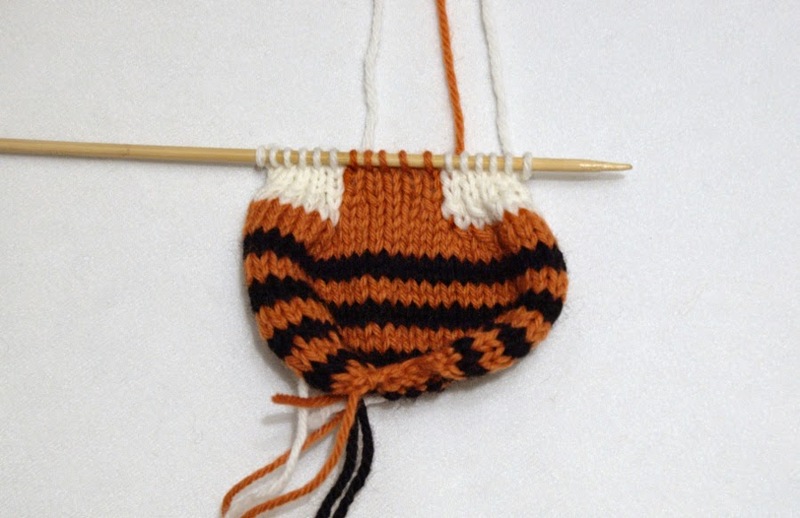 It's looking a little more like the tiger's head now. 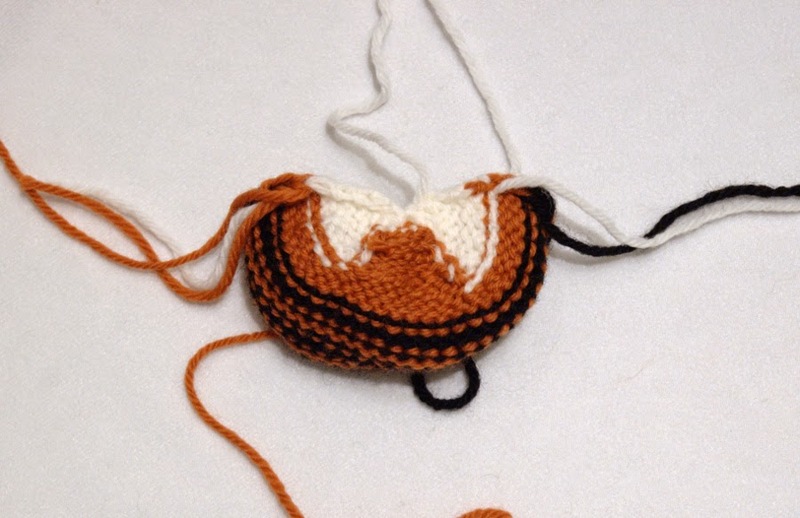 Step 7: Before you can finish the head, you need to weave in the yarn ends from the intarsia sections. If done incorrectly, you will get holes on the right side. 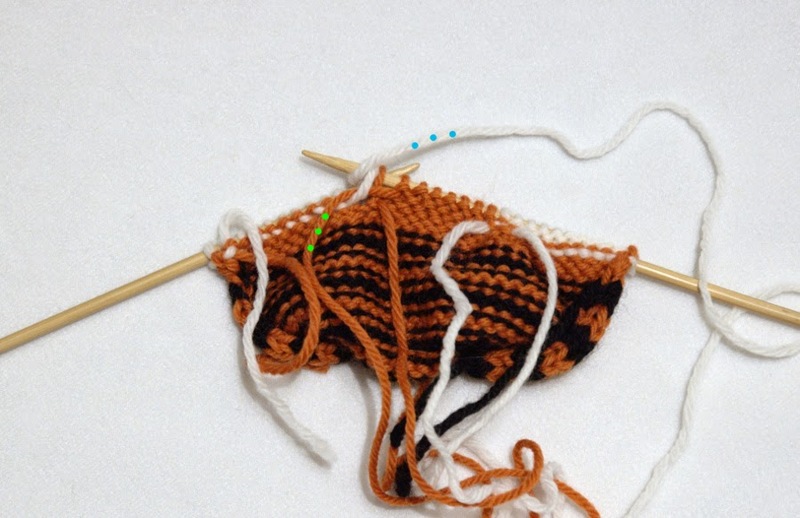 A good way to start is to make a short stitch to the side of your yarn end, in the direction of the next colour. Check on the right side, to make sure any holes have been closed. Step 8: Then weave in the yarn end securely, using your preferred method. I like to thread the end along a row of purl stitch bumps, working towards the side of the piece. Then I can tie them off as I sew the seam. Other ends are woven in so they won't show on the right side. Now you can attach safety eyes or buttons, sew up the seam, and stuff the head. Some other tutorials that might be useful: soft sculpture to give the face more character, and how to embroider the nose and mouth. Here is what the finished toy will look like! I hope you've found this tutorial useful. If you want more help with this technique, there are many video tutorials. 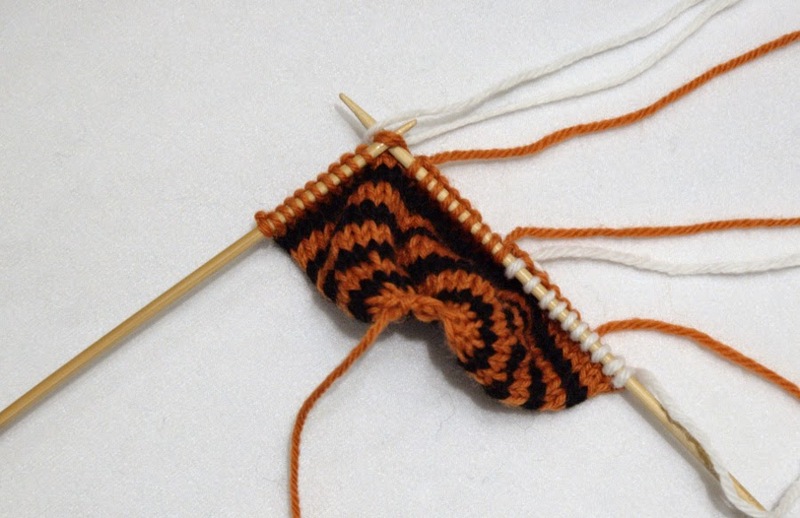 A search for "intarsia knitting" should find something that works for you. June 27, 2014 at 4:46 p.m.
Onya Barbara..Very proud of you Sweetie. June 29, 2014 at 5:53 a.m. Thank you so much for the new approach to this pattern! Love it!!! August 1, 2014 at 4:43 p.m.